If I go to About This Mac and click on the Storage tab, it tells me that I have 500 GB of Flash Storage and that 15.49 GB of 399.57 GB is free. It will also tell me that 226 GB is for System, 130 GB is for Documents, and 25.8 GB is for Apps. Tools like OmniDiskSweeper or Disk Inventory X will report the same basic information. They will generally account for the space that the Storage tab says is being used by Documents and Applications, but I cannot seem to figure out where the 226 GB of files are that the "System" part is using. I had this situation come up once before and rebooting the machine cleared out the used space and I got a couple hundred GB back. I could do that again, but I would like to be able to track down what these files are. My problem is related to the question What is the correct way to eject a APFS dmg from the command line? What was going on is I was mounting APFS DMGs via hdiutil attach and only ejecting one of the disks. The disk left behind was taking up hard drive space. After I fully ejected the volume, my hard drive space came back. The way I was able to spot this easily was by using Apple's Disk Utility application and saw a bunch of grayed out Disk Images. Well, I remember I have faced this problem before. This had to do with Spotlight indexing. Try this and tell me if there's a difference. Click the plus sign and add your whole hard drive! 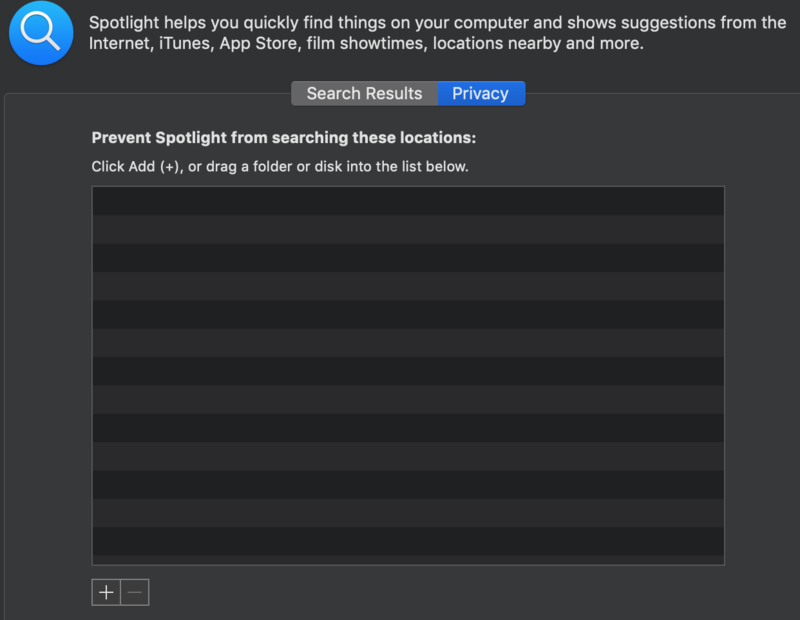 Then simply remove it and spotlight will start indexing your whole system. It will take some time and then see your usage. See if it changes! I had a similar problem and it was turned out the the Library folder had almost 125 GB. there are 2 Library folders and I'm referring to the one in my home directory. Not the one you show thats on the same level as Applications and Users. In that Library folder there was a folder named Mobile Documents. That folder contained around 90 GB. I was using iCloud drive as a backup for my main drive and those files were also showing up in my /Library/Mobile Documents. I don't understand what was going on or how the files were stored but once I removed the files from the Icloud Drive, it freed up close to 90 gB on my disk drive. Not the answer you're looking for? Browse other questions tagged macos hard-drive disk-space . What is the correct way to eject a APFS dmg from the command line? Running out of hard drive space, yet Disk Inventory shows only 190GB used vs. 480 GB used in HD Get Info? How is that possible? Does mounting a large disk image require a certain amount of free space on the internal drive? Where is my disk space going? Os X El Capitan: will System Integrity Protection patch .AppleSetupDone exploit/hack? How can I fix permissions for files in the /var/folders/zz?